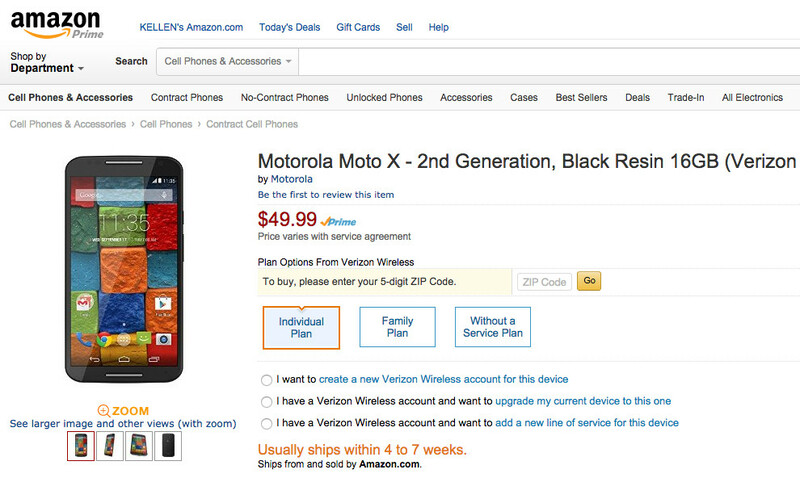 If you are looking for the best deal on the Verizon or AT&T Moto X (2nd gen) and are willing to sign a 2-year contract, Amazon is your place. The black resin version is available for either carrier at $49.99 on-contract, which is $50 less than you would pay directly. If you want Bamboo, the Verizon unit is currently $79.99, a $20 discount. If you want Leather or Bamboo on AT&T, Amazon has them listed for $69.99, which is a $50 discount. Keep in mind that in our guide on how to upgrade at Verizon and keep unlimited data, we mention that some have had success using Amazon for discounted phones while keeping unlimited. Of course, you need to proceed with caution there.